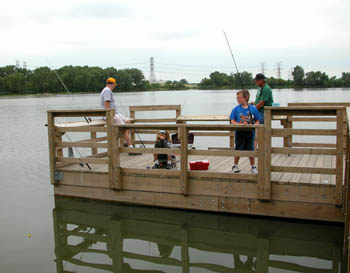 William C. Sterling State Park is best known as the only Michigan park on Lake Erie, for its sandy beach and as a popular departure point for walleye anglers. But the park is dedicated to marshland and was named after William C. Sterling, a Monroe County businessman who by the mid-1800s already realized the value of wetlands to man as well as wildlife. Sterling was a passionate hunter and in 1878 he began buying the nearby marshland for as little as 30 cents an acre because nobody else saw the value in swamps. A decade after his death in 1924, a group of Monroe citizens proposed that 115 acres north of the River Raisin be preserved as a park and named in his honor. Sterling State Park was officially dedicated the following year and today still protects a small portion of the once-extensive wetlands, including four lagoons and the marshes that surround Sandy Creek Outlet. 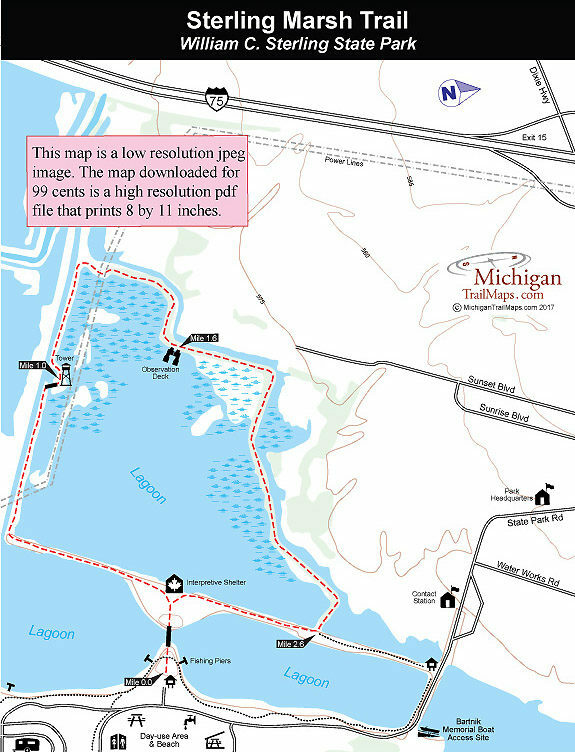 In 2002, Sterling was closed to undergo the the largest single state park renovation in the history of Michigan. Department of Natural Resources officials felt the $17 million project was necessary because of Sterling's role as a gateway park. Like Warren Dunes near the Indiana border and Porcupine Mountains just east of Wisconsin, Sterling is often the first state park out-of-state visitors stop at. The heart of the project was building a new 47-acre campground on higher ground along Lake Erie where it overlooks the widest and nicest section of beach in the park. But many other smaller improvements were part of the renovation including upgrading Sterling Marsh Trail. Part of the park’s 6-mile system of paved paths, The 3-mile trail loops around the park’s largest lagoon, passing a tower, observation deck and interpretive area all dedicated to viewing wildlife. The park’s improvements and the lagoons now make Sterling something of a wild oasis in the middle of heavily urbanized area that includes a nuclear power plant to the north and a coal-burning power plant overshadowing it to the south. The 1,300-acre park offers excellent opportunities for birders during the spring and fall migrations, as the lagoons attract a variety of birds and waterfowl including great blue herons, bluewing teals, mergansers and large numbers of Canada geese along with smaller shorebirds. Egrets are especially easy to spot here. The large, slender white birds that stand more than 30 inches high begin showing up at the park in late March and can be enjoyed until cold weather drives them south in mid-November. 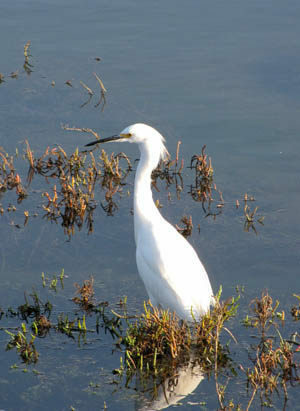 In late spring and early summer, it's possible to spot 30 to 40 egrets at a time. One of the most popular improvements of the Sterling renovation was the addition of the pedestrian bridge that now provides direct access from the campground and the day use area on the east side of a lagoon to Sterling Marsh Trail on the west side. 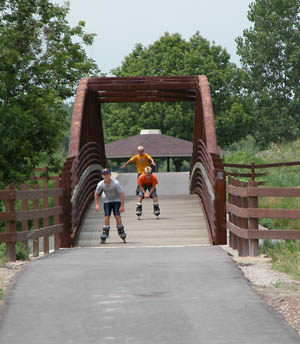 The bridge coupled with the re-surfacing has made the fully handicapped accessible trail as popular with campers on their bicycles and in-line skates as it has with hikers. The trail was also equipped with 11 interpretive stations and is designed to be followed in a clockwise direction. The trailhead is located in a small parking area on the north of the large day-use area and from there you quickly reach the pedestrian bridge that arches across a narrow channel between two lagoons. On the other side you arrive at a shelter with interpretive panels and two spotting scopes where time can be spent looking for waterfowl and birds. Head south (left) as the trail begins skirting the largest lagoon in the park, a 320-acre, restored Great Lakes marsh. Straight ahead are the twin towers of the Detroit Edison power plant but if its spring or fall the sights and sounds of migrating birds will easily command your attention. The trail follows a dike between the two lagoons and within a half mile swings sharply west where there is a bench. Soon you’re passing underneath a set of power lines and cross another foot bridge to arrive at the observation tower at Mile 1. From the top of the metal structure you have a view of the entire lagoon. Within a third of a mile the paved path swings north, passes beneath the power lines a second time and at Mile 1.6 arrives at an observation deck where a pair of compact binoculars can be put to good use. Beyond the deck the trail begins swinging to the northeast, passing views of fairways and greens of a golf course and then a neighborhood. On one side of you might be an egret or two, on the other somebody is shanking his drive. Sometimes in a world as urbanized as Southeast Michigan, this is as close as we can get to nature. Sterling’s new campground features 256 sites in an open area along Lake Erie with paved pads and a fire ring and modern restrooms. There are also 39 pull-through sites for large recreation vehicles along with 77 sites with full hook-ups; water, sewer and 50-amp electrical service. Sterling also has more than a mile of beach front along Lake Erie with a shallow swimming area. Bordering the wide sandy shoreline is an open, grassy picnic area with a store, bathhouse, toilets and a play area. On the north side of the park is Jerry Bartnik Memorial Boating Access Site with a launch ramp, fishing cleaning station and parking for 250 vehicles and trailers. Located just north of Monroe, Sterling is reached from I-75 by departing at exit 15 and heading east on Dixie Highway for a mile to its signposted entrance. Contact the Sterling State Park headquarters (734-289-2715). To reserve a campsite contact Michigan State Park Central Reservations (800-447-2757; www.midnrreservations.com).